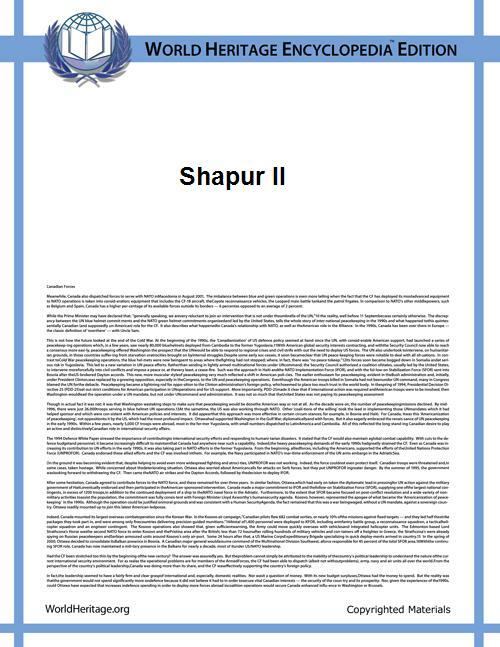 Shāhanshāh: "King of kings of Iran and Aniran"
Shapur II (Middle Persian: 𐭱𐭧𐭯𐭥𐭧𐭥𐭩 Šāhpuhr), also known as Šāpūr II the Great (Persian: شاپور دوم بزرگ‎‎), was the tenth king of the Sasanian Empire. The longest reigning monarch of the Sassanid dynasty, he reigned from 309 to 379 and was a son of Hormizd II. During his long reign, the Sasanian Empire saw its first golden era since the reign of Shapur I (241–272). His name is sometimes given in English as "Shahpour" or "Sapor". When King Hormizd II (302–309) died, Persian nobles killed his eldest son Adhur Narseh after a brief reign, blinded the second, and imprisoned the third (Hormizd, who afterwards escaped to the Roman Empire). The throne was reserved for the unborn child of one of the wives of Hormizd II. It is said that Shapur II may have been the only king in history to be crowned in utero, as the legend claims that the crown was placed upon his mother's womb while she was pregnant. This child, named Shapur, was therefore born king; the government was conducted by his court and Zoroastrian priests. During the early years of the reign of Shapur, Arabs crossed the Persian Gulf from Bahrain to "Ardashir-Khora" of Pars and raided the interior. In retaliation, Shapur led an expedition through Bahrain, defeated the combined forces of the Arab tribes of "Taghlib", "Bakr bin Wael", and "Abd al-Qays" and advanced temporarily into Al-Yamama in central Najd. He resettled these tribes in Kerman and Hormizd-Ardashir. Arabs named him, as "Shabur Dhul-aktāf" or "Zol 'Aktāf" that means "The owner of the shoulders" after this battle. In 337, just before the death of Constantine I (324–337), Shapur II, provoked by the Roman rulers' backing of Armenia, broke the peace concluded in 297 between Narseh (293–302) and Emperor Diocletian (284–305), which had been observed for forty years. This was the beginning of two long drawn-out wars (337–350 and 358-363) which were inadequately recorded. After crushing a rebellion in the south, Shapur II invaded Roman Mesopotamia and recaptured Armenia. Apparently 9 major battles were fought. The most renowned was the inconclusive Battle of Singara (Sinjar, in Iraq) in which the Roman emperor Constantius II was at first successful, capturing the Persian camp, only to be driven out by a surprise night attack after Shapur had rallied his troops (344-or 348?). Gibbon asserts that Shapur II invariably defeated Constantius, but there is reason to believe that the honours were fairly evenly shared between the two capable commanders. (Since Singara was on the Persian side of the Mesopotamian frontier, this alone may suggest that the Romans had not seriously lost ground in the war up to that time.) The most notable feature of this war was the consistently successful defence of the Roman fortress of Nisibis in Mesopotamia. Shapur besieged the fortress three times (337, 344? and 349) and was repulsed each time by Roman general Lucilianus. Although often victorious in battles, Shapur II had made scarcely any progress. At the same time he was attacked in the east by Scythian Massagetae and other Central Asian tribes. He had to break off the war with the Romans and arrange a hasty truce in order to pay attention to the east (350). Roughly around this time the Hunnic tribes, most likely the Kidarites (Chinese Jiduolo), who's king was Grumbates, make an appearance as an encroaching threat upon Sasanian territory as well as a menace to the Gupta Empire (320-500CE). After a prolonged struggle (353–358) they were forced to conclude a peace, and Grumbates agreed to enlist his light cavalrymen into the Persian army and accompany Shapur II in renewed war against the Romans. In 358 Shapur II was ready for his second series of wars against Rome, which met with much more success. In 359, Shapur II invaded southern Armenia, but was held up by the valiant Roman defence of the fortress of Amida (Diyarbekir, in Turkey) which finally surrendered in 359 after a seventy-three day siege in which the Persian army suffered great losses. The delay forced Shapur to halt operations for the winter. Early the following spring he continued his operations against the Roman fortresses, capturing Singara and Bezabde (Cirze?). Constantius arrived from the west at this time, and unsuccessfully tried to recapture Bezabde. In 363 the Emperor Julian (361–363), at the head of a strong army, advanced to Shapur's capital at Ctesiphon and defeated a superior Sassanid army at the Battle of Ctesiphon; however, he was killed during his retreat back to Roman territory. 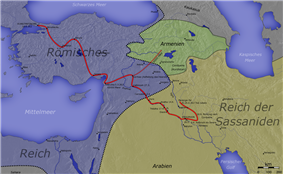 His successor Jovian (363–364) made an ignominious peace, by which the districts beyond the Tigris which had been acquired in 298 were given to the Persians along with Nisibis and Singara, and the Romans promised to interfere no more in Armenia. The great success is represented in the rock-sculptures near the town Bishapur in Persis (Stolze, Persepolis, p. 141); under the hooves of the king's horse lies the body of an enemy, probably Julian, and a supplicant Roman, the Emperor Jovian, asks for peace. According to the peace treaty between Shapur and Jovian, Sauromaces II. Shapur II subdued the Kushans and took control of the entire area now known as Afghanistan and Pakistan. Shapur II had conducted great hosts of captives from the Roman territory into his dominions, most of whom were settled in Susiana. Here he rebuilt Susa, after having killed the city's rebellious inhabitants. Shapur later died in 379, although he had a son named Shapur III, he was succeeded by his brother Ardashir II. By Shapur's death the Sasanian Empire was stronger than ever before, considerably larger than when he came to the throne, the eastern and western enemies were pacified and Persia had gained control over Armenia. He is regarded as one of the most important Sassanian kings along with Shapur I and Khosrau I, and could after a long period of instability regain the old strength of the Empire. His three successors, however, were less successful than him. Furthermore, his death marked the start of a 125 year old conflict between the Wuzurgan and the Sasanian kings who both struggled for power over Iran. Shapur II was not initially hostile to his Christian subjects, who were led by Shemon Bar Sabbae, the Patriarch of the Church of the East. However, the conversion of the Roman Emperor Constantine I to Christianity gave Shapur distrust towards his Christian subjects, whom he considered as agents of the foreign enemy. The war between the Sasanian and Roman empires changed Shapur's mistrust into hostility. After the death of Constantine, Shapur II, who had been preparing for war for several years, imposed a double tax on his Christian subjects in his empire to finance the conflict. Shemon, however, refused to pay double tax. Shapur then gave Shemon and his clergy a last chance to convert to Zoroastrianism, which they refused to do. It was during this period the "cycle of the martyrs" began during which "many thousands of Christians" were put to death. 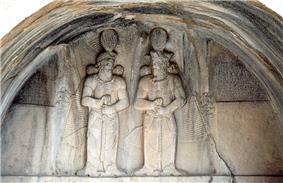 The two successors of Shemon, Shahdost and Barba'shmin, were also martyred the following years. Under Shapur II's reign the collection of the Avesta was completed, heresy and apostasy punished, and the Christians persecuted (see Abdecalas, Acepsimas of Hnaita and Aba of Kashkar). This was a reaction against the Christianization of the Roman Empire by Constantine I. He was successful in the east, and the great town Nishapur in Khorasan (eastern Parthia) was founded by him. He founded some other towns as well. ^ a b c d Touraj Daryaee, Sasanian Persia, (I.B.Tauris Ltd, 2010), 16. ^ .The History of the Decline and Fall of the Roman EmpireGibbon, Edward. ^ Adur Narseh, A. Tafażżolī, Encyclopædia Iranica, (December 15, 1983). ^ Pourshariati 2008, p. 58.